All rooms have their own entrances and are comfortable self catering and fully serviced which is available as either two singles or as one King size in beds, bathrooms are en-suite. DSTV & Free Wireless Internet access available in all rooms. Dining and lounge area is communal for all guests. Each room has its own kitchenette and refrigerator, microwave etc. Quiet peaceful garden atmosphere...close to shops and shopping centers, Farenheit restaurant a block away. 11 km from OR Tambo International Airport. Close to Linksfield Golf Course and Modderfontein Golf Course as well. Situated approximately 11km from OR Tambo International Airport and the highway access to Edenvale has NO E-toll . 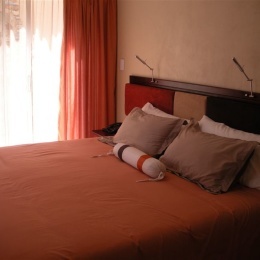 This owner run guest lodge epitomizes warm hospitality and service excellence. We have our own off road parking and are Non-Smoking throughout the Guest House ashtrays are provided outside. We enjoy sharing our special home and garden and are very proud of the area we live in, so we are only too happy to help plan a day out or recommend one of the splendid restaurants in the area to finish off the day. Guests are very welcome to borrow guide maps & books.